MiPortland Downtown: Beerfest on the Bridge 2019 - 150 Year Celebration with YOU! Beerfest on the Bridge 2019 - 150 Year Celebration with YOU! 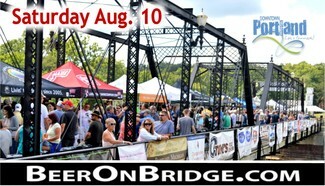 Presented by the MiPortland Downtown Program, the 5th annual Beerfest on the Bridge will be held on Portland's historic Veterans Memorial Bridge in downtown Portland. Built in 1890, this landmark is one of many bridges in the 'City of Two Rivers' creating an attractive and historic entrance into main street. The beerfest will host to 14 Mi Breweries, 2 Cideries and 3 Wineries, with live music to round out the festival atmosphere. Food will be from Sweet Carolines BBQ and Catering Gobblin Good to Go & Maria’s Tacos. Last year this was a sold out event and with your help, we plan to grow it even bigger this year! Proceeds from Beerfest support Portlands Christmas celebration Holidayfest. Please assign Dennis and I to the same booth or next to each other. Thanks! Sue Martin & Deb McClung; Red wine station preferred; Please provide a tent for the wine stations this year.